Home › Investing › What Are The Rules For Roth IRA Withdrawals? Among retirement accounts, the Roth IRA is considered one of the most attractive for its tax advantages. Roth IRA contributions are made with after-tax dollars so qualified distributions are not taxed but what are the withdrawal rules for Roth IRA accounts? What Is The Required Minimum Distribution For A Roth IRA? When Are The Rules When Taking Roth IRA Distributions? How Do I Avoid Roth IRA Penalties? Roth IRA account holders over the age of 59.5 are permitted to withdraw earnings as long as the account has been held for at least 5 years. Under that age, withdrawals are permitted upon death, when disabled or when using up to $10,000 to build a first home. When building a first home, the Roth IRA account holder is permitted to withdraw up to $10,000 over a lifetime. Roth IRA accounts must be held for at least 5 years before earnings withdrawals are permitted. Earnings may otherwise be subjected to a 10% penalty in addition to taxes owed. Roth IRA account holders are not subject to minimum required distributions, unlike 401(k) and traditional IRA account holders, who must begin taking distributions at age 70.5. Unlike 401(k) and traditional IRA retirement accounts, Roth IRA account holders are not subject to required minimum withdrawals. The reason for this is that you already paid taxes to the IRS when making Roth IRA contributions whereas 401(k) and traditional IRA distributions are tax deferred and so the IRS mandates a withdrawal minimum at age 70.5 in order to ensure they receive tax payments. The benefit of no required minimum withdrawal is that Roth IRA contributions can grow for as long as you wish. And if you choose to pass on the account to your heirs without ever taking withdrawals that too is permitted. Roth IRAs give you excellent benefits that can help you maintain your lifestyle during retirement. Some times, though, people want to take Roth IRA distributions before they reach 59½. Before that age, you may face a penalty for withdrawals. Know the rules before you take a Roth IRA distribution. Otherwise, the government may force you to pay a fine that lowers your investment’s opportunity for growth. Unlike some retirement investment vehicles, you have to pay taxes on the money you contribute to your Roth IRA. By paying taxes today, though, you avoid taxes when you make withdrawals from your account. Tax-free withdrawals mean that you can grow your money without getting penalized by the government. The benefits become obvious when you look at the numbers. For example, if you start contributing $5,000 per year at age 30 with an expected 7% rate of return, you will pay taxes on the $175,000 that you pay into the account by the time you turn 65. Your Roth IRA, however, will have a value of about $740,000. That means you avoid taxes on $565,000. Even if tax rates increase over the next few decades, you will not have to pay taxes on the money that you earn from your Roth IRA. You can use an online Roth IRA calculator to determine how much tax-free money you will get from your contributions. You can withdraw money from your Roth IRA before you turn 59½, but you will pay a 10% penalty in most cases. The penalty should encourage you to leave your money alone so it can help fund your retirement years when you will have little or no income. Still, the opportunity to withdraw before 59½ exists. Consider, though, that you end up losing more than the 10% penalty. If you withdraw $20,000, you will pay a $2,000 fine. You will also lose the compound interest that the $20,000 would have earned. Depending on the specific investments that you choose for your Roth IRA portfolio, withdrawing $20,000 will likely mean that you lose thousands of dollars in interest. Unless you have to access your Roth IRA money, let it accumulate interest. Keep in mind that the interest you earn this year will become part of your Roth IRA balance. The interest, in other words, will earn interest, leading to exponential growth. Become too disabled to work. Inherit the Roth IRA from someone else, such as a spouse or parent. Need to withdraw up to $10,000 to cover the closing costs or down payment of your first home. Have medical expenses that exceed 10% of your adjusted gross income. Are an active duty member of the military. Need the money to pay for health insurance during unemployment. Use the money to pay for qualified education expenses for you, your spouse, or your child. You can also withdraw penalty-free money from your Roth IRA to pay federal taxes. In this situation, though, you can only avoid the penalty by letting the IRS issues a tax levy and takes the money from your account. If you withdraw the money independently, then use it to pay the government, you will pay the penalty. Although you can withdraw money from your Roth IRA without paying a penalty, you should talk to an accountant or tax professional before doing so. Make sure you understand the rules, or you might get hit with an unexpected fine. 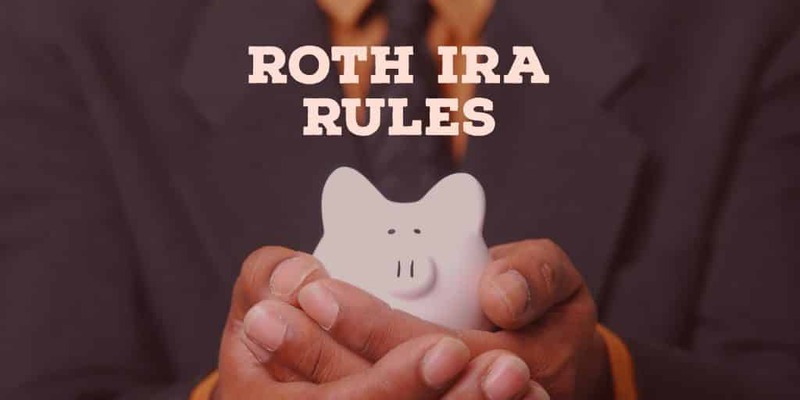 The rules when taking Roth IRA distributions follow a strict order, beginning with direct contributions, then money converted to the Roth IRA account, and finally earnings on contributions. The Internal Revenue Service has stipulated rules that follow a certain order when taking Roth IRA distributions. When money is withdrawn, the order begins with contributions made directly. Any money that has been rolled over from another Roth account, such as a Roth 401(k) or that has been converted from a traditional IRA is next. Earnings on contributions are counted last. Roth IRA account holders who have built up a large nest-egg can take withdrawals tax-free and without penalties but those who started accounts recently and have not contributed much may be penalized. Exceptions to Roth IRA early distribution penalties include distributions due to disability, death, a first home, qualified education expenses, health insurance premiums when unemployed, unreimbursed medical expenses, and when substantially equal payments are taken. Although a Roth IRA account holder must generally be held for five years to avoid 10% penalty fees on earnings, the Internal Revenue Service has a list of exceptions which permit withdrawals without incurring the penalty. When substantially equal payments are taken that lock you into a minimum of one distribution each year for at least five years or until you are aged 59.5, whichever comes later. ‹ Lemonade Insurance Review – Renters & Home Insurance From $5!